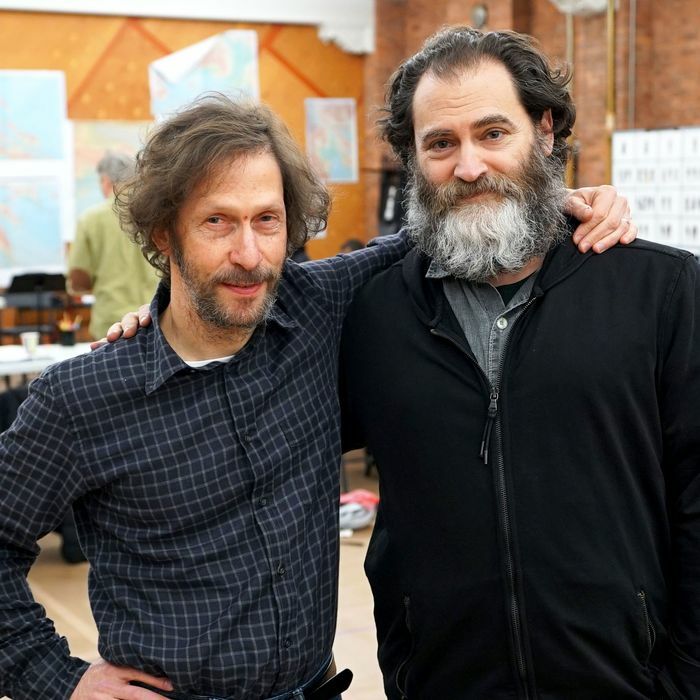 While rehearsing their play Socrates at the Public Theater, Tim Blake Nelson and Michael Stuhlbarg appear themselves like a pair of old-fashioned philosophers — maybe it’s the voluminous beard that Stuhlbarg has grown out to play the title role, or the fact that Nelson, who wrote the script, is able to outline his thoughts in what feel like neatly prepared paragraphs. The two actors (and in Nelson’s case, sometime writer and director) are best known for their work on film — specifically, their collaborations with the Coen brothers — but they’ve known each other and worked together since they attended Juilliard a few years apart. Nelson, the more direct and professorial of the two, wrote his new play Socrates with Stuhlbarg in mind. The play dramatizes the major events in the philosopher’s life during classical-era Athens, including the public debates that Plato (one of Socrates’ acolytes) recorded in the Dialogues, Socrates’s trial for corrupting the youth of Athens, and his subsequent death by hemlock. Though he plays the pugnacious philosopher onstage, compared to Nelson, Stuhlbarg is quieter and more circumspect. Between the two of them, there’s plenty of room for an old-fashioned philosophical dialogue, which we had about the making of the play, their careers, and how Socrates’ Athens mirrors our democracy. I was trying to find my notebooks from reading Socrates in college to prepare, so we’ll see how much I can remember. Michael Stuhlbarg: I’m sure Tim will be able to help you. Tim, from what I’ve read about this, you were a classics major in college and had the idea in the back of your mind for a play about Socrates. Nelson: You knew that. The part Maggie Siff played, the rabbi. Stuhlbarg: Forgive me, that’s right. Nelson: Then there was a part in Anesthesia, the most recent film I made, that I wrote for Michael. But he couldn’t do it, so I played that role. Stuhlbarg: I didn’t know that, either! Nelson: But this one, he decided he was available. [Laughter] It’s always a question with Michael if he’s available, because of course, everybody wants Michael. Michael, you were also at Juilliard when Tim was there. Two years younger? Stuhlbarg: That’s right, two years behind Tim. I first became aware of Tim there and had seen side projects that he had been creating at that time that just blew my mind. That year there was an election, and Tim had created this piece just trying to figure out how the country was going to vote for the upcoming election. That was the first thing I saw that Tim had made that really captured my imagination and excited me. And then also you were in The Grey Zone, which Tim wrote, the play and the movie. Stuhlbarg: Getting to do his play The Grey Zone back in 1996, this is kind of a reunion for Tim and I, having done that play way back when. Nelson: As I said, I write for Michael. I wrote the part of Hoffman in Grey Zone for Michael. Literally when I was researching that play and I was reading these diaries of the Sonderkommandos in this book called Amidst the Nightmare of Crime, which were diaries. It’s just basically straight translations of diaries that were buried at Birkenau and they’re filled with lacunae. There are ellipses, dots, where the lacunae are. And it made the characters, the writers, seem so tender and vulnerable and conscience-stricken. I thought, “That’s Michael.” So I started writing that role for Michael. I had been advocating for years that the Coen Brothers hire him, and really pushed that and talked with Joel a lot about him. And then I wanted that role in A Serious Man, and they gave it to Michael! Stuhlbarg: He would have been wonderful. Nelson: No, you were definitively who that guy is. I remember the bittersweet-ness of that because of course I was happy they were going to, that they’d found such a great role for Michael. How did you assemble who your version of Socrates would be from the various dialogues we have that include him? Nelson: There are three different Socrates at the very least, if you really oversimplify it, in Plato’s Dialogues. There’s Socrates himself; there’s this hybrid of Socrates and Plato, which is a sort of transitional figure; and then there’s Plato speaking his ideas as Socrates. Nelson: Right. I guess what I’ve needed to do as a writer is to isolate what’s “Socrates as Socrates” in Plato, and then take some of the combination of Socrates and Plato that overlap, and when it works for the play and doesn’t seem to contravene who Socrates was, to exploit that area as well. And then, take the rest of what is Socrates — what is a combination of Plato and Socrates and then just pure Plato — and then have that inform who the character of Plato is in the play. Then, there’s a second level at which, to make it dramatic, one has to take the version of Socrates in Plato who feels like, “Yeah, that’s the guy, that’s Socrates,” and turn it from philosophy into playwriting. That has had to allow for a very, very free approach to the adaptation of it. So it’s pushing Socrates from the Dialogues in a direction he doesn’t really go, both through changing what he says and also making the people who argue against him better arguers, because Plato was not a playwright, he was a philosopher. Thank God! He says in Apologia, “Look, I went out and I talked to people and tried to find truths,” and I was imagining, “What would that really have sounded like, particularly since they ended up killing the guy?” What did the people with whom he was speaking sound like? And why was it so offensive? Not to spoil ancient history, but I imagine Socrates’ execution has to play into the drama. How do you act out death by hemlock? Stuhlbarg: It is very specific, and Tim has been quite generous in helping me with what the progression of that process would be. It’s all in his play. It’s all written, the steps that he would go through under those circumstances. I can’t tell you what it’s like on the outside, having never seen myself go through it, but I imagine it would be troubling. Even in the choosing of the hemlock, he wanted the strongest potency of the hemlock as possible even though, apparently, Plato tried to soften it somehow. We really watch the body trying to save itself. I could imagine trying to stage Socrates’ life in a different context, like with modern dress as an allegory or something, but this production’s done literally and with period costumes. Was that important to you? ﻿Nelson: Whenever I was speaking to theaters who were considering doing this play — and directors, this is before [director] Doug Hughes was involved — any sort of modern-dress version of this was a nonstarter for me. It was essential to me that it be done as a period piece. I don’t believe that modern dress is an essential signifier, in any production of this play, to make it relevant to a modern audience. I think everything that’s happening in this play is absolutely relevant to a modern audience. Being able to present it as depicting democracy at its inchoation makes the relevance of these issues that have plagued democracy ever since. One example is a variously informed citizenry — how do you deal with that? But being able to depict those issues as valent throughout democracy’s entire journey, and probably into its future, makes those issues all the more profound and challenging and worthy of our attention. Thankfully Doug didn’t disagree, and I think he’s going to put up a really wonderful production of it. You have a large 16-member cast, too. Nelson: Sixteen playing, I’d say easily over 50 roles. I think that the reason for as large a cast as possible is essential, because so much of what Socrates did took place in public. That needs to be emphasized, particularly now when we’re finding ways, as a polity, to engage with our leaders and our leaders are finding ways to engage with us that are increasingly public through technology. My 14-year-old son is on Trump’s Twitter feed. He’s not a Trump supporter, but he’s interested in politics, and he’s one of millions of people who can very publicly experience Trump’s misspelled, grammatically incorrect musings that haven’t been filtered, haven’t gone through the apparatus of determining what’s appropriate for a public to experience from a leader and what isn’t. So in a sense, we’re living in an even more public time. It’s like we’re back in the agora with everyone within shouting distance. So I think it’s important for the audience to experience that, and when Michael is talking about virtue with someone, the more people onstage, the better, because it was public — and that’s part of what pissed everybody off! Tim, you were just in Buster Scruggs, and Michael, you got a lot of attention for Call Me By Your Name — it feels like you both have gotten to do these exciting, larger projects. Do you feel like there are more opportunities for you at this moment? Nelson: I have more opportunities right now than I have time for. Before O Brother, Where Art Thou? my attitude was, Any story told onscreen that wants me, I will go and do it. I threw myself at any audition without regard to what the ethos of it was, at the most commercial dreck that came my way. In fact, the more commercial the better because it would expose me to more of the apparatus of telling stories onscreen. If it was commercial, particularly if it involved television, that meant it might go on a lot so I would get more time in front of the camera and around the camera, and I’d make more money so that if the time came when I did want to make my own stuff [I could]. That was my ethic. When O Brother happened, I’d been doing what I just described for ten years, and I actually had made two films by that time, so I had a lot of time on sets and I used it well. But when O Brother happened, I had the luxury of getting to choose. It’s a luxury that probably neither of us ever expected having. I don’t think you ever expected it, did you? Nelson: And I think with that comes a degree of responsibility, not to a public. That would be silly to say, because I think I don’t do something, somebody else is going to do it and I’m sure they’ll do a fine job, so I feel lucky for any job I get. I’m talking about responsibility for myself. But I look at a few other actors and one of them is Michael, as a sort of integrity barometer. Stuhlbarg: As Tim is a compass for me and has been since I’ve known him. That’s truth. He seemed to have some foresight, in terms of a kind of trajectory for me within this profession, encouraging me to stay here, to exercise my trade and learn, and that work would come, and that this would be a better place to do that than to do so elsewhere. Tim, you advocated for him staying in New York? Nelson: There was a moment where he was maybe gonna go out to L.A. and be there and be more available and more exposed, and I just said, “Michael!” I think this is what you’re talking about. Nelson: It just felt inevitable that if he remained in New York and continued to do theater, that a truly rich, deep, life onscreen was going to come his way. André Aciman has said he’s working on a sequel to Call Me by Your Name and it seems like the father’s character is expanded in that. Michael, have you talked to him at all about it? Stuhlbarg: I haven’t, more than in brief conversations. I think the prospect of bringing those characters back around and examining where they are a number of years later, what happens to them, is a thrilling prospect because we all enjoyed the process of making that film so much and the richness of his novel from which it came, and he’s such a generous spirit; I would be curious to know where they are as well, so I’m thrilled. If they want me, I’m there. Tim, are you filming Damon Lindelof’s Watchmen series right now, as you’re working on this play? Nelson: Luckily for me they shut down for two months and so I didn’t miss a single rehearsal [on Socrates]. I’ve missed two tech rehearsals, and Doug doesn’t even want me at those anyway! He doesn’t want to feel the impatient playwright wondering when we’re going to get on. I’m not done with Watchmen but luckily, I’m going to go back to it after we open. Damon writes in a peculiar way, in which, even though you’re a part of the main cast, he will do a deep dive with your character in one episode. In the episode we shot before we took the break, I worked every day and was pretty much in every scene. In this next episode, I don’t appear at all, nor do any of the main cast members, except for one and she’s just in there barely. I can’t give any details. Stuhlbarg: Just to toss this thought in here really, it has been absolutely thrilling to be in the rehearsal room with Tim, as it was before when we did The Grey Zone, simply to watch the process of discovering perhaps a more specific way to convey an idea. As complicated as that process can be, it’s still one of the main reasons I wanted to do this, was to be in a room with you, to have you figure out for yourself the story that you wanted to tell. Nelson: It’s been particularly challenging for Michael, because he has so much to say in this play and I had to be, shall we say, benignly callous about the work it was going to involve for him when I made changes. You don’t know this, but I’ve felt terrible about it! Stuhlbarg: Don’t, because that’s the process. It is absolutely what we do. Nelson: He’s had to deal with a lot! Stuhlbarg: It has been challenging, but at the same time, challenging in the best way.